Divers enjoying the waters off Darwin, the northernmost island in the Galapagos, suddenly realised the presence of an amazing 33 feet (10 meter) albino whale shark (Rhincodon typus), and as if one sighting of an albino giant wasn’t enough, a snow-white southern right whale (Eubalaena australis) calf has now been spotted off the coast of Western Australia. 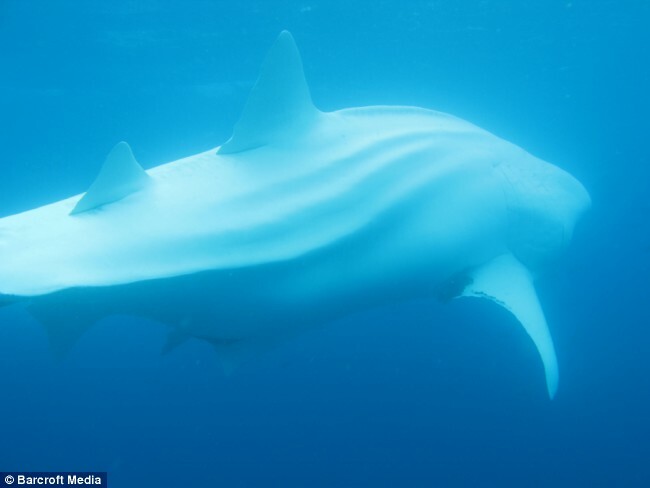 The whale shark encountered in Galapagos is and adult female and was first observed by naturalist Antonio Moreano as he guided a group of scuba diving tourists. “I told everyone to keep a distance and not disturb it so we all jumped in the water and followed it for five minutes.” says Moreano who also managed to get a few pictures of the awe-inspiring creature. The young albino southern right whale lives in the whale nursery waters off Western Australia together with its 60-tonne mother. 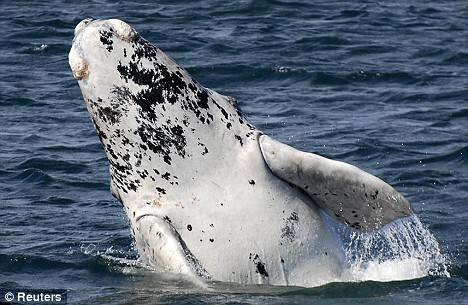 It has been given the name Wilgi Manung, which means “white whale” in one of the indigenous Australian languages. According to Doug Coughran, a senior wildlife officer with the department of environment and conservation, Wilgi Manung might not be a pure albino since its eyes and nose does not display the characteristic pink flesh normally seen in albino whales. Albinism is a hypopigmentary congenital disordered. It can be partial or total, i.e. characterized by a partial or total lack of melanin pigment. Albinism is caused by recessive alleles and must therefore be inherited from both parents to manifest. Albinism has been observed in many different animals, including mammals, birds, fish, reptiles and amphibians. The name albinism is derived from albus, the Latin word for “white”.